WITH his latest release, Robert Mitchell has delved into ‘another world’ – a place where Maurice Ravel, Bill Evans and others have gone before, but perhaps not with such solitary exposure! 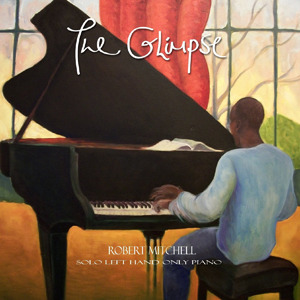 ‘The Glimpse’ is an album of entirely ‘left hand only’ works for solo piano, the majority crafted by Mitchell himself, but also with offerings from Fred Hersch and Federico Mompou. As many a player would testify, the left is often recognised as the less dominant hand at the piano, acting as support (chordal or otherwise) to the more melodic right. To showcase it alone, then, across the whole range of a Steinway D Grand is something of a challenge, to say the least! Robert Mitchell, however, has clearly explored and researched how to achieve connected and engaging performances of these sinistral pieces with great attention to variance of dynamics and sensitive and judicious use of the sustain pedal. It is difficult to categorise the genre to which this collection belongs – perhaps classical, maybe chamber jazz – yet it doesn’t actually matter. It’s a diverse soundworld, with a number of the twelve compositions being beautifully spacial and lyrical, whilst others with complex patterns and keen tempi are staggering in their precision, range and (no doubt) muscular strength! The flamboyant ‘A Confession’ is strikingly animated and spiky, with a strong, pacey rhythm and repeated phrases, making it difficult to become convinced it is the so-called ‘weaker hand’ presenting this elaborate display! Repeated, close listening does little to dispel such disbelief, the technique being so remarkably fluent. ‘The Re-Emergent’ is similarly demanding, relentless in its pulsating journey across the piano’s vast range. Hersch’s ‘Nocturne for Left Hand Alone’ is just that, with a yearning, romantic melody and an accompanying arpeggioed lower part, suggesting maybe Chopin, Field and Rachmaninov all at once. ‘The Sage’ is another masterful exercise in melody and searching accompaniment “to integrative thinkers/intuits everywhere”, whilst the closing ‘Alice’s Touch’ provides an elegant and thoughtful response to its dedicatee. Whirlwind’s clear engineered sound, recorded in the excellent acoustic of Liverpool’s modern Capstone Theatre, takes the listener right there, to hear every nuance of these remarkable written and improvised works. Robert Mitchell is currently touring this new release (along with workshops and an upcoming ‘Leftitude Festival’ in March), and one can imagine the live experience to be both audibly and visually rewarding, particularly in satisfying curiosity that ‘the left’ can, indeed, single-handedly put on such an assured display!